Heather Guntherberg of Pineapple Paddling is teaming up again with Paddle On of Williamsburg to offer another SUP Yoga Teacher Training!! Come out for an amazingly fun and informative 3 day training and immerse yourself in nature and channel the power of the water as you enhance your paddle, yoga and teaching expertise. 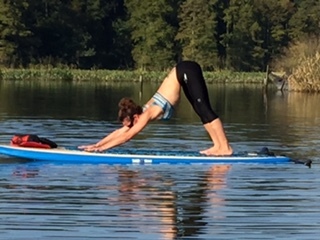 During our training together you will learn the basics of Stand Up Paddleboarding, water safety, paddleboard equipment, how to guide a SUP yoga class, how to create a SUP yoga studio and how to create a successful SUP yoga business. Heather is a 200 RYT Hatha Yoga, Certified H2Y0 SUP Yoga Teacher, WPA Class Level 2 Instructor, Paddle Fit Core Certified Coach and Certified in CPR, AED and First Aid through the American Heart Association. At the completion of this training you will be certified as a SUP Yoga Teacher AND World Paddle Association Level 1 Instructor. All students will receive 20 Yoga Alliance continuing education credits upon completion of this course. *Have at least their 200RYT ( or be working towards it). Students who do not have their 200 RYT may participate in the weekend of the training but will not receive official certification until their 200 hours is complete. Jamestown Beach has plenty of parking and restrooms and outside showers for your use.